One could say that this is a picture of Auto Union's first big star and second big star racing together for the very first time. Early in 1935 Stuck had reached the top of his career, but from the Avusrennen on, it would go downwards while perhaps even more significantly, this was Bernd Rosemeyer's debut race. Hans Stuck (27 December 1900-9 February 1978) had a Swiss grandfather, was born in Poland, lived in Germany and Switzerland and gained an Austrian citizenship after WW2. After having spent the first World War in an artillery regiment on the Western front Stuck studied agriculture and engineering, before settling down to manage his parents' estate in Freiburg. In 1923 he started racing in local hillclimbs with a Dürkobb. In 1926 he got works support from Austro-Daimler and the next year he became works driver. By 1929 he dominated the European mountain climb season, and became known as the Bergmeister, or the King of the Mountains, a nickname that would follow him throughout his racing career. Good looking, at 185cm tall, and with considerable charm Stuck had an ability to win friends. His relationships with women proved a bit turbulent, as he was married three times. Three of the friends from the 20s made great impact on his future career. One was Crown Prince Wilhelm, whose connections enabled Stuck to get hands on one of only three Mercedes-Benz SSKL in existence. The second one was Ernst Udet, an ex-fighter pilot, whose record of 62 kills ranked him second of Germany's aces after the famous "Red Baron" Manfred von Richthofen, who made Stuck interested in speed record attempts. That interest later culminated in the secret Mercedes-Benz/Porsche/Stuck T80 project for the absolute land record, a project that was interrupted by the war. And the last friend to be mentioned was Julius Schreck, a man who proved to be the chauffeur and personal bodyguard to a certain Adolf Hitler. It was Schreck that introduced Stuck to Hitler in 1925. It is certain that Stuck had a great influence on Hitler's attitude to motor racing and made him realize its propaganda value. In 1931 when Stuck was without a drive Schreck organized a meeting with Hitler, who promised that he would make arrangements when the moment was right to place a German Grand Prix car to Stuck's disposal, a promise that Hitler held. In 1932 Stuck had married Paula von Reznicek, a tennis player who happened to have a jewish grandparent. In the Nazi harassment that followed, Stuck's personal acquaintance with Hitler proved to be of immense value later in the career. It is hard to follow the complicated intrigues, as depending of who made the orders Stuck was either attacked or protected. He was harassed by Gestapo and there were anti-Stuck banners seen all over the track at a German hillclimb in 1935, but on Hitler's orders the SS later made a full turn and organized Stuck's comeback to Auto Union, after he had been sacked from the team in 1937. During the depression lots of car factories either disappeared or were integrated into other firms. In this fashion German businessman Jörgen Skafte Magnussen's DKW factory had taken over the Audi Werke AG in 1928. In 1932 two more car factories were integrated, Horch and Wanderer Werke AG. Together they formed the Auto Union, symbolized by four rings. In an effort to promote an image as a high-tech products producer Auto Union considered building racing cars for the new 750kg formula coming in effect in 1934. To their delight they found out that advanced plans for such a car already existed. Back in 1932, Dr. Ferdinand Porsche, who had worked as a consultant for Wanderer, had, along with amateur driver Adolf Rosenberger, formed the Hochleistungsfahrzeugsbau GmbH for the precise purpose of developing a Grand Prix car. All the drawings for the P-Wagen, as Porsche called the new car, were ready and only the lack of funds was hindering the cars to be built. Auto Union took over the project and asked the Government for economical backing. Transport minister Brandenburg offered 500 000 RM yearly subsidy plus bonuses of 20 000, 10 000 and 5 000 RM for podium finishes. As both Auto Union and Mercedes-Benz showed their interest the subsidy was later divided, each team receiving 250 000 RM. The new cars were manufactured at the Horch works at Zwickau. Horch was known for their high-quality luxury cars. (Bernd Rosemeyer later used to run a Horch Cabriolet.) The cars, later to be known as the Auto Union A, followed the design used by the Benz Tropfenvagen back in 1923 with the driver in front, the fuel tank in the middle and the engine at the rear. The chassis was made of two large diameter tubes connected by tubular cross members. The suspension was independent all over with trailing links and torsion bars at front and a swing axle with transverse leaf springs at the rear. The engine was designed to give as much torque as possible rather than top speed. It was a 45° V16 of 4.4 litres volume with a single cam driving the valves with pushrods. With a huge Roots supercharger it was giving about 300bhp at 4500rpm, but the power band was so good that it has been said that a driver could do quite good laps even at the Monaco track without any need for gear changes. The cars received a streamlined futuristic light metal body painted in silver. The cars were to be nicknamed "Silberfische" (Silver Fish) against the Mercedes "Silberpfeile" (Silver Arrows). The first new car was ready in October 1933 and first tested by ex-Benz racer Willy Walb before it was Stuck's turn. On March 6t, 1934, Hans Stuck made headlines with the Auto Union as during testing on the Berlin Avus track he set three new world speed records (100 Miles, 200 km and one hour). It was also on that track that the new cars made their race debut on May 27th, driven by Hans Stuck, Prinz Hermann zu Leiningen and the diminutive August Momberger, known to the others just as "Bubi" (the kid). As the flag fell Stuck took the lead and after the first lap he had opened up a one-minute gap to the second placed car. Later Stuck had to retire with clutch problems but he had shown the potential of the new construction. The 1934 season proved to be Stuck's best ever. He led the Auto Union team against Mercedes-Benz and the Ferrari-run Alfa Romeos and proved victorious in the German, Swiss and Czech GPs, and he would have been 1934 champion if the championship had been organized that year. He also raced the car at Felsberg, Kesselberg, Freiburg and Mt. Ventoux hillclimbs and became the 1934 German hillclimb champion. Stuck finished off the season by returning to Avus and setting five new world records (1km, 1 Mile, 50km, 50 Miles and 100km with standing starts). For 1935 four new B-type cars were built with improvements on 56 points over the old cars including an increase of the engine volume to 4.9 litres to give 375bhp. Later in the season a 5.6-litre variant also appeared. There were also tests with covered streamliners both for Grand Prix races and record attempts. The team retained the services of Hans Stuck and Hermann zu Leiningen and signed on Italian Achille Varzi. As reserves the team selected GP privateer Paul Pietsch and the young motorcycle racer Bernd Rosemeyer. Having won the Tunis GP twice before Varzi was keen to have his first start as an Auto Union driver there. The new Auto Union cars were not ready but Varzi persuaded the team to send an upgraded 1934 car both to Tunis and to Tripoli. Stuck was not amused when he found out that the team was going to start the season with the Italian but without him, so Stuck managed to get a streamlined speed record car with an enclosed cockpit ready for him for the Tripoli race. Varzi won at Tunis and would have won at Tripoli if not a lengthy last-minute pitstop had delayed him. Tripoli however proved to be quite a frightening experience for Stuck. During the race Stuck's car caught fire but the driver in his closed cockpit was unaware of it for quite a while driving on with huge flames coming out of the rear of the car. When Stuck finally realized the situation the brakes had already gone and he had great problems to stop the car. A shaken Stuck was helped out of the closed cockpit by nearby officials. The fifth Avusrennen was held to the free formula on May 26, 1935. The Avus track in the Grunewald in Berlin consisted of two parallel 9km long roads with 180° curves at both ends enabling the cars to reach enormous speeds. The track had proved to be dangerous, especially when it was raining. There had been several bad accidents when the German GP was held there in 1926 and Mercedes-Benz driver Otto Merz had crashed fatally during practice for the 1933 Avusrennen. Freightened by his Tripoli experience Stuck elected to drive an open racer (B-type chassis 760012). Varzi also raced one of the new cars while zu Leiningen and Rosemeyer, who was making his debut as car racer, had to be content with streamlined A-type cars. It was for this race that Rosemeyer made his famous daily notes into team manager Walb's calendar at the office (Only 20 days to Avusrennen. Will Rosemeyer start? Only 19 days… Only 18 days… and so on) until getting an assurance that he indeed was included in the team. Mercedes-Benz entered four cars, Ferrari ran three Alfa Romeos, while Scuderia Subalpina brought five Maseratis. Next to them, there were several independent entries. To make it more interesting for the spectators the race was divided into two 5-lap heats plus a 10-lap final. During practice Stuck was in a class of his own with a lap of 4:31.3 (260 km/h). The best the other drivers could do was 4:47 for von Brauchitsch and Varzi and 4:49 for Rosemeyer. The Auto Union was up to a speed of 326 km/h on the straight! The cars in the first heat were lined up two and two according to practice times (not by ballot as said in Nixon's Silver Arrows). Stuck held the pole position to the right and Rosemeyer found himself in the front row for his first ever car race inside the streamliner (type A chassis 76003). When the flag dropped Stuck immediately took the lead. The veteran driver had no problems to open up a gap to his new team mate. Fagioli, leading the Mercedes challenge, passed Rosemeyer and started the chase for the leading Auto Union. As feared tyres became a problem. Rosemeyer also had a high-speed tyre failure at the Nordschleife and was lucky to be able to stop the streamliner without crashing, but his debut race was over. Stuck took victory having led the race from start to finish. In the final Stuck again held pole position and once again he took the lead, with him and Varzi beginning to open up a gap to the Mercedes trio of Fagioli, Caracciola and von Brauchitsch. Then Fagioli started to charge, he passed Varzi and closed up on Stuck. Stuck led until he had a nasty incident when a tyre burst at 290km/h. He was lucky to be able to handle the car and get it back into the pits for a new tyre. He was not the only one with tyre problems, for both Varzi and von Brauchitsch had similar incidents and all the top cars except for Fagioli had to stop for new tyres. Fagioli thus won the race for Mercedes-Benz with Chiron in second place while Varzi and Stuck finished third and fourth over 2 minutes behind the winner. Three weeks later Rosemeyer became Germany's new hero with his drive at the Nürburgring and Stuck slowly faded away from the top of the results lists in Grand Prix racing. His last major GP victory came in the 1935 Italian GP and thereafter his major triumphs were restricted to hill climbs. After the war Stuck somehow managed to obtain Austrian citizenship and returned to the race tracks with a Cisitalia. Later he became involved with the AFM project and also raced BMWs before finally retiring in 1963 after having taken 427 victories in 700 events during 38 years. He lived to see his son Hans-Joachim become a works Formula 1 driver for March and Brabham. The AVUS (Automobil-Verkehrs- und Übungsstrasse, Automobile traffic and training road) was located southwest of Berlin, in the Grünewald, a large wood area. The layout was simple, two parallel 9.78km straights, separated by an 8m grass strip, and two corners. It followed an existing railroad track, ideal for transporting gravel during the construction, and spectators during race days. The Nordkurve, located at Eichkamp railway station, had a radius of 50m and an inclination of 1:12, the Südkurve (near Nicolassee station) was considerably slower with a radius of 12.5m only, and an inclination of 1:7. Construction began in 1911, based on a 1907 decree of Emperor Wilhelm II, but due to interruption by WWI, completion was only in 1921. The AVUS was not only a race track, but also a toll road allowing fast and easy motoring from downtown Berlin to the lake recreation areas in the Southwest. The first race meeting was held on September 24/25, 1921, organized by the AvD (Automobilclub von Deutschland) as a special attraction to the International Automobile Exhibition held at Berlin that same week. In total six races took place, open for standard production cars of classes VIIIA, VIB, XB, VIA, VIIIB, and XA, where the Roman figures indicate the (tax) HP, and A or B the valve-train construction. Fastest lap of the day was set by Fritz von Opel with 9'8". Although some of the races had been very boring - e.g. four contenders and one single finisher in race VIIIB - it was an enormous success. 300,000 spectators watched the event on grandstands erected along the straights and at the corners. Remarkable of the races in the 1920s was the 1926 Grosser Preis von Deutschland for sportscars, which was won by a 1924 Mercedes 2-litre Grand Prix car, driven by an unknown young salesman of Daimler's Berlin affiliate bearing the unusual non-teutonic surname Caracciola - a name worth to remember. With its two long straights and two bankings the AVUS was a high-speed track, and it took its toll - always and in all decades. In 1926 the lap record was already below 7 minutes, with top speed on the straights more than 200km/h. Numerous accidents happened, during a fatal one of Mercedes driver Rosenberger a timekeeper and 3 spectators were killed. Frightened by these accidents the government decided to close the track for racing. It was reopened only in 1931. Nevertheless it was used for tests, record attempts, and some curiosities. In 1928 Fritz von Opel tested his famous rocket car here, 24 solid fuel rockets in the back accelerated it up to 220km/h, and in 1932 Manfred von Brauchitsch raced in his SSKL Mercedes against flying ace Ernst Udet. The most glorious period of the AVUS was in the 30s. Although the Grand Prix of Germany was held at the Nürburgring, the non-championship AVUS Rennen had at least the same importance. After the reconstruction of the Nordkurve into the famous wide-radius loop built up to a 43-degree bank with a vertical concrete retaining wall at the top the AVUS became even faster. Hermann Lang with a streamlined Mercedes reached a top speed of 380km/h and an average speed of 261.7km/h, a record which was topped only in 1958. After WWII it took several years before the noise of racing engines could be heard again in the Grünewald. The people of Berlin had more serious problems to solve. Only in 1951 the first race was held, won by Paul Greifzu in his BMW Special. In 1967 the the banked Nordkurve was pulled down, and the AVUS was fully integrated into the Berlin highway network. In 1970 it was shortened to 8.1km, reducing the straights to 4km each. Since 1975 only two races per year were allowed due to noise claims filed by a group of nearby residents. The final swansong for the AVUS was in 1996. After the fatal accident of British driver Kieth Odor in 1995 the Berlin Senate banned racing on this famous and unique track forever. After the very fast race at Tripoli on May 12, which was won by Rudi Caracciola with a sensational average of nearly 200km/h, an even faster race followed on the AVUS on May 26, again under the freedom of Formula Libre. Auto Union introduced its 1935 specification car, and added closed cockpit 1934-style cars for zu Leiningen and newcomer Bernd Rosemeyer. Daimler-Benz matched that with a fourth machine for Hans Geier, only this of its quartet having a closed cockpit canopy. The Alfa-Romeo Bimotores were also out again, keeping Nuvolari and Chiron in contention. In view of the high speeds the number of starters was restricted and 2 five-lap - 98km - heats preceded a ten-lap final for eight qualifiers from a 19-strong field. Stuck won the first heat in runaway style, with Fagioli's Mercedes second, and Dreyfus' Alfa Romeo and Geier's closed Mercedes completing the qualifiers. Varzi was fastest in the second heat, but a tyre change saw Caracciola come through to win. Behind Varzi, von Brauchitsch, and Chiron's Alfa filled the qualifying places. Tyre troubles kept Nuvolari's sister Bimotore out of the final. Stuck set the early pace in the final, but after 3 laps a blown tyre at 290km/h gave him a heartstopping time and Fagioli the lead, chased hard by Caracciola, Varzi, and von Brauchitsch. Varzi also suffered a tyre failure after seven laps, while Caracciola retired with supercharger problems, and von Brauchitsch also fell back. The upshot was that Fagioli won at 238.6km/h average from Chiron - who, likewise went through non-stop - with Varzi third after a second tyre change, and Stuck fourth. Stuck had the lap record up to 260.6km/h, though strangely this fact did not appear in the official results. 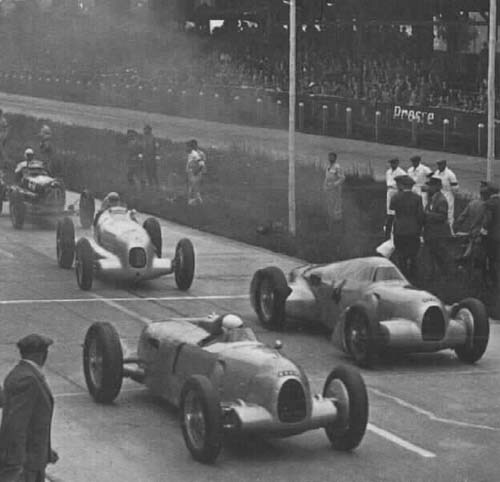 The ageing champion and the rookie, Hans Stuck and Bernd Rosemeyer, both driving for Auto Union, side by side on the first row of the starting grid. When believing his own words Stuck was then 35 years old, though some have alleged that it was more 40 or even 45. Fast driving was his passion already very early, so his friends urged him to enter a proper hillclimb being held near Baden-Baden. It was the summer of 1923 and Stuck was able to claim first in class. From now on he entered any hillclimb his time allowed, and Austro-Daimler took notice of this new driver, so Stuck became member of their works team in 1927. Although they concentrated mainly on hillclimb events and reliability runs, it should be mentioned that in 1930 Austro-Daimler entered a car for Stuck in the Monaco Grand Prix, where unfortunately he was not able to see the finish line. The recession took its toll, and in 1931 Austro-Daimler decided to close down their competition department. Trying to find a new home at Daimler-Benz was in vain, because they had been faced with the same financial problems, but he was able to purchase one of the famous SSKLs at a special price to continue his career as a privateer. Being nicknamed the Bergkönig (King of the Mountains) he still had most of his successes in hillclimbs, with only sporadic appearances at Grands Prix. At the 1931 Masaryk GP in Czechia he drove his SSKL to a 2nd place behind Louis Chiron in a Bugatti T51. Already before he became Chancellor in 1933, Hitler announced that Germany has to compete on the world's racetracks in order to demonstrate their technological might, and Professor Dr. Ferdinand Porsche, who after his retirement from the board of Daimler-Benz had set up his own development and consulting company at Stuttgart, started construction of a Grand Prix car as early as November 1932. At this time Porsche had no agreement with Auto Union, but only the earlier expressed interest of Wanderer - one of the AU combine companies - to enter Grand Prix racing. His order book was empty, and only with the financial help of Porsche's old friend Adolf Rosenberger, a wealthy amateur racing driver, the project came off the ground. Rosenberger in 1924 and 25 had driven the Benz mid-engined GP car, it is believed that his experience with this car had the final influence on the layout of the Porsche project No. 22 - the later AU GP racer. Most probably Rosenberger envisaged himself as one of the drivers of the finished product. Wanderer and the newly formed Auto Union combine still could not be convinced to enter the project, and only after in March 1933 the new government announced subsidies for motor sport participation the agreement between AU and Porsche could be finalized. Rosenberger was not able to harvest the fruits of his financial investment. Very early he saw the writing on the wall, and being Jewish, he emigrated to the USA as early as 1934. This was the chance for Hans Stuck. Having good relations to both Professor Porsche and Adolf Hitler (whom he met as early as the mid 20s, and who promised him that when he came to power a race car would be placed at his disposal) Stuck became the number one driver for the new team, and most probably it was his relation with the Führer that the subsidies - which principally had been promised to Mercedes-Benz in full already - finally were split between them and Auto Union. Like Hans Stuck also Bernd Rosemeyer had this early passion for speed, but lacking the wealth of Stuck's family he was restricted to motorcycles instead of cars. Already in young years he was (in)famous in his neighbourhood, because although caught by the police countless times, he continued to ignore the legislation that driving a bike requires a driving licence. The great day came - his 18th birthday, and consequently his driving licence! Now he was able to participate in official motorcycle events, which he did with great success. His outstanding abilities had been recognized, and in 1932 he joined the works team of NSU, besides BMW and DKW the leading German motorcycle factory of the time. After countless victories he joined in 1934 the DKW team, because there he saw his chance to change 2 wheels against 4, as DKW besides Horch, Audi, and Wanderer was the fourth of the AU rings. And in fact, his chance came in November 1934, when AU held their "search-for-talent" driving tests at the Nürburgring. He immediately was familiar with the rear-engined beast, often described as undrivable by more experienced race drivers, and equalled the lap times of No. 1 driver Hans Stuck. So team manager Willy Walb offered him a contract as reserve driver for the 1935 season. The AVUS Rennen featured here was his first car race ever. Nevertheless he managed 4th fastest practice time behind Stuck, Varzi, and von Brauchitsch, and consequently second on the grid for the first heat (the 8W photo). Unfortunately Rosemeyer had a high speed tyre failure at the Nordschleife, and was lucky to be able to stop the streamliner without crashing, but his debut race was over. Stuck took victory having led the race from start to finish. The same year Rosemeyer presented a brilliant drive at the German Grand Prix at the Nürburgring, beaten only by the much more experienced Caracciola by 1.8 seconds. He celebrated his first GP win on September 29 at the Masaryk Grand Prix at Brno. For the next year he was signed as a full team member, and his successes continued - he won the GPs of Germany, Switzerland and Italy, the Eifelrennen, the Coppa Acerbo, the Großer Bergpreis von Deutschland, the Feldbergrennen, and finally the European Championship. A new star was born! While another was sinking. Although second in the championship, Hans Stuck was not able to win a major race, and except for Monaco Rosemeyer was faster also in qualifying. Stuck entered the 1936 season as driver No. 1 but ended it as loser. He stayed in the AU team also for 1937, but due to his discontent and bitterness finally the team claimed that Stuck's best years were now long past, and unceremoniously fired the driver who had so ably driven for them the last four years. Not long afterwards his friends in the Nazi government interceded on his behalf. This coupled with the death of Rosemeyer and the weakness in their current driver line-up forced a reluctant Auto Union to re-sign their wayward driver in mid-season only a few months after his initial dismissal! After the war Hans Stuck continued to drive and finally retired in 1960 after a remarkable career that spanned four decades. Taking the age given by himself he was 60, but 1900 as year of birth was always doubted, so it may well be that when retiring his true age was 65 or even 70. Truly remarkable! In 1978 he passed away and his son, Hans-Joachim continues to uphold the family name in racing.